Most of the activities here are simple to do with materials found in your home or at the library. The activities can be added to your life at home as you and your kids play, work, and grow together. Coloring pages are fun, but they also help kids develop many important skills. These skills, eye-hand coordination, color concepts, picture comprehension, form the foundation for early learning success. Kids who color generally acquire and use knowledge more efficiently and effectively. These maze games, dot to dot, how to draw and crossword puzzles provide hours of fun for kids. Hidden pictures, color by number and picture puzzles are just a few other printables in this section! 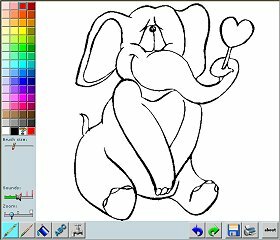 A fun online coloring book app with many pictures! You can color the picture online and print it, or print the pictures and then color with crayons!